Last year, we wrote about the Bhushan Steel Bankruptcy (read post: The Bhushan Steel Bankruptcy Saga) The resolution gave the company to Tata Steel, which renamed Bhushan Steel to Tata Steel BSL, which continues to be listed. The latest price, Rs. 34 per share. That’s a Market cap of around 3,500 crores so far. Tata Steel will now buy more shares. This is an indirect route: Bhushan Steel will issue Rs. 9,000 cr. worth Optionally Convertible Preference Shares. These can be converted to Bhushan Steel (TATASTLBSL) shares at Rs. 30.43 per share. Tata Steel will own 92.6% of Tata Steel BSL (old Bhushan Steel) with about 375.2 cr. shares. Totally there will be 404 cr. equity shares. Is this Good? Bad? Ugly? It’s actually much much better than we earlier thought. Our view was that the first tranche of shares (79 cr. odd) were issued to Tata Steel at Rs. 2 per share. So they would convert the rest at Rs. 2 also and therefore, see a massive dilution. This is still massive, but not quite as much. Also importantly, the Convertible shares carry an interest of 8.89% a year. Which means about Rs. 800 cr. of interest will have to be paid on them till the conversion. We’ll come to this. How do you now value a Bhushan Steel (TATASTLBSL)? If you look at the interest component on what they have to pay – they will have about 26,000 cr. of debt remaining. (Tata Steel put in 35,000 cr. and this 9,000 cr. is now going to be converted to shares). Tata Steel has issued themselves that debt at about 11%, meaning that interest costs will be about 2900 cr. There is about Rs. 1,200 cr. of depreciation per year. EBIDTA per tonne could be pushed up to Rs. 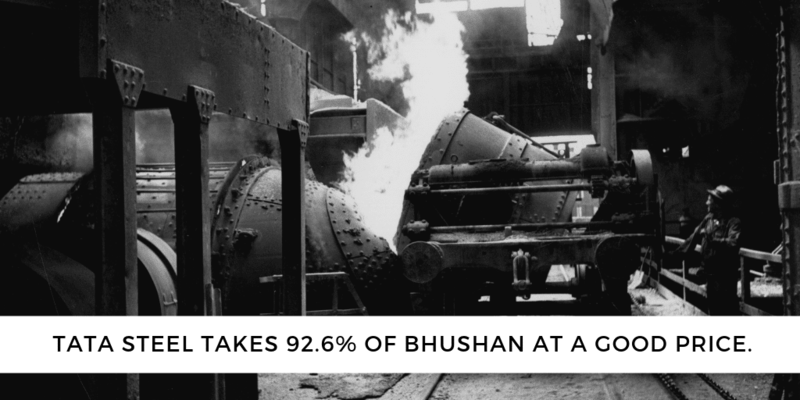 10,000 per tonne, which for Bhushan Steel at 50 lakh tonnes means an EBIDTA of Rs. 5,000 cr. Subtract the depreciation and interest, and you have about Rs. 900 cr. in profit. Assuming you pay 30% tax, that’s net profit of Rs. 650 cr. A P/E multiple of 10 would provide an equity value of Rs. 6,500. Spread across 404 cr. shares, this is about a price of Rs. 16 per share. That would mean the current price of Rs. 34 is a little high. Steel companies could be valued another way : EV to EBIDTA. EV = Enterprise Value = Equity Plus Debt. For an EBIDTA of Rs. 5,000 cr. , let’s also cross check what EV-EBIDTA we are paying for Tata Steel itself. The answer is about 6 times. JSW Steel is 7 times. Let’s give Bhushan a 6.5x and say that the EV is 5000 x 6.5 = Rs. 33,000 cr. At that point, debt is 26,000 cr. so the Equity is valued at Rs. 7,000 cr. Again, for 404 cr. shares this is a price of Rs. 17.5 per share. But still, there are questions – all these valuation estimates assume conversion. If Tata Steel does convert they could quickly force a delisting of the company, since they will have more than 90%. And then, shareholders may not be able to exit in any meaningful way. We expect that the Tata’s will play nice here – and either merge the company with Tata Steel, at a possible conversion price closer to Rs. 30 per share (effectively) after conversion. Eventually, of course, the future will depend on the performance of Tata Steel. That performance hasn’t been all that great, even with a steel upcycle. A return of capex planning in the economy would do it a lot of good, so the real verdict will have to be after the budget later this year. 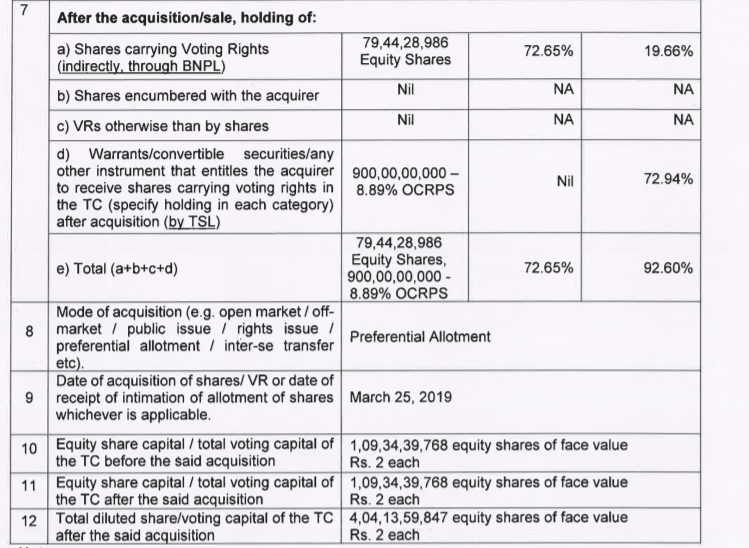 For Bhushan Steel (Now Tata Steel BSL) shareholders, this conversion must be a sigh of relief, because it provides clarity on exactly what the minority shareholders will own in this business.